This chapter provides an overview of the symptoms of frailty, the tools used to recognize and assess older people living with frailty such as the frailty phenotype and frailty index, and some of their common palliative care needs. Further, it details some of the perceived challenges of frailty to current palliative care practice, namely, recognizing dying, multiple morbidities and symptom burden, and the focus or goals of care. Palliative care for older people with frailty requires a broader disability rather than a single disease focus. Coordination and interdependencies with other care providers become as important as the discrete patient/professional clinical encounter. The centrality of the older person with frailty and their “family” living and dying over time means the social environment becomes paramount local resources; support and the interplay between services and community are vital. 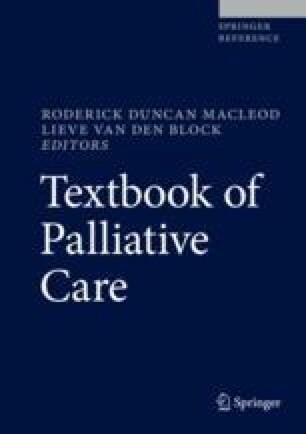 While evidence on the best ways to provide palliative care to this population is still developing, the chapter offers some examples of current services and suggests key elements derived from the literature and practice. The authors suggest there is a moral and clinical imperative for palliative care services to engage with older people with frailty and their caregivers, both lay and professional. This imperative brings opportunities and challenges, including revaluing living and dying rather than an overemphasis on care in the last days of life and remodeling palliative care services to focus more on need than diagnosis and the reorientation of palliative care, so that it can be integrated with older people’s services. Evans CJ, Ison L, Ellis-Smith C, Nicholson C, Costa A, Oluyase AO, Namisango E, Bone AE, Brighton LJ, Yi D, Combes S, Bajwah S, Gao W, Harding R, Ong P, Higginson IJ, Maddocks M. Rapid scoping review of service delivery models to maximise quality of life for older people at the end of life prepared for the World Health Organisation (WHO). King’s College London; 2018. Available from: http://www.who.int/kobe_centre/mediacentre/news/EOLC_report/en/. The Clinical Frailty Scale. http://camapcanada.ca/Frailtyscale.pdf.